Now that spring is upon us and the weather is warming up, it is time to start thinking about your summer bedding plants, what are you going to grow, where you are growing them. It is about being prepared, if you break down the jobs into smaller tasks which just take a few minutes at a time, it is surprising how more organized you are, this is true with sorting out your summer bedding plants too. If you know what you are doing, and the tasks you need to do in advance, it is easier to move with the flow of life and fitting in the extra tasks as and when you need to. The first decision is where you want your summer bedding plants, once you’ve a location then it is picking the right bedding plants for that particular spot. Not all bedding plants are equal, they have their differences, they can have different needs too, and finding plant species that fit with the garden you have and the location you have in mind, the more successful your summer bedding plants will look. Understanding the consequences of a lack of water, what this can do to bedding plants is a disaster that I am very familiar. Whilst I love hanging baskets, I have decided not to have them again. I just forget to water them regularly enough and the lifting of the water to the container is not easy when you’re restricted on height, as I am. Therefore, I know that my bedding plants are in the ground or in pots, these I can manage to grow well. If for example, you were going away for extended periods in the summer, then bedding plants that don’t have access to water, either through a neighbour or friend watering them or, an irrigation system being put in place. Then there is a chance that these plants could die from a lack of water. Choosing options that don’t need vast quantities of water is a great idea, they can look good with minimal care and attention. If you are growing your own from seed then it is a great idea to get started, giving them time to germinate and grow strong before transplanting to their summer home. The alternative is to buy the plugs; these as established plants, they come in pots, you harden off the plants and can even grow them on a little to make sturdy plants that will give the summer displays that you are after. I have done it both ways and it just depends on the budget as to the option I choose, if I have a little bit spare I will buy the plugs and save me time, if I don’t have spare funds I will grow the bedding plants from seed which are cheaper than the price of established plants. Knowing what you want and doing your research on the plants that you like, will save you spending money on items that aren’t suitable for the option you are considering. Think about the colour, not just the flower they will produce but how it will work with what you already have, this will allow you to get the results you are looking for, there is nothing worse than poorly positioned bedding plants that just don’t make their full potential and that is a shame. Therefore, it is time to start organizing your bedding plants, think about what you want, the colours you want to use and where they will spend their days. 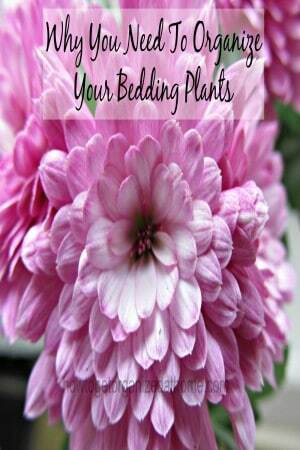 Start putting together your plan of action as to the look of your bedding plants this year. I love seeing my thoughts and ideas coming together in the garden! These are GREAT tips! I plan on working in my garden this weekend so they will definitely come in handy. Thanks for linking up to Merry Monday, hope to see you again next week!